Best Seller! Made in the USA, BPA Free, 27 ounce Bottle. Tapered base with finger grips, fits auto cup holders. Molded from food-safe PETE. PETE is BPA/BPS Free and FDA Compliant as safe for food contact. Push pull sports lid. Order 100 per bottle color. 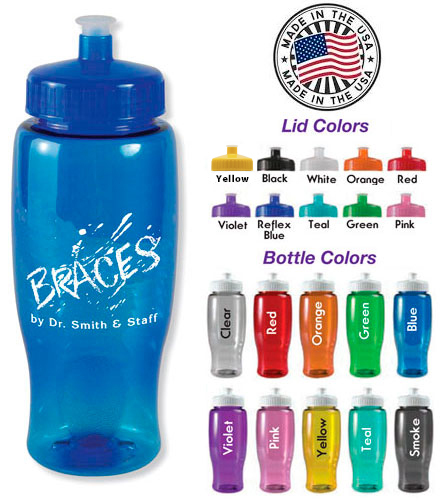 To order 50 per bottle color, add $0.10 per piece. To assort lid colors, add $0.15 each. "Art, Setup charges, and additional imprint color charges will not appear in your shopping cart. Once your order is submitted, a Century 2001 sales representative will contact you to complete your order." Enter your imprint text in the box below or indicate if you will be using your custom logo.